If you want to explore the entire interior of Mt. Silver, you'll need to take along Pokémon that know Flash, Surf and Waterfall. The Pokémon inside the mountain are very strong—if you're having trouble with the wild Pokémon, you're definitely not ready for the final showdown with the person waiting at Mt. Silver's summit. Train hard! Mt. Silver is actually in Johto, but you can walk up to it only from Kanto. After you've visited Mt. Silver once, you can fly back to it from Johto. In Gold and Silver, the items in this dungeon aren't great, but going after them gives you something to do while you hunt for a Misdreavus and a Larvitar, two great Pokémon you won't want to miss. 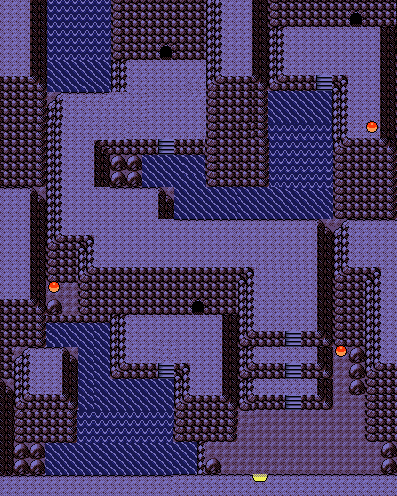 The nocturnal Misdreavus are only in the second area (with the waterfalls), so concentrate there. Mt. Silver is a little bit more interesting in the Crystal version. Larvitar is much easier to catch (good news if you saved your coins at the Celadon Game Center), and you may even run into its very rare 2nd-stage form, Pupitar, up at the summit. 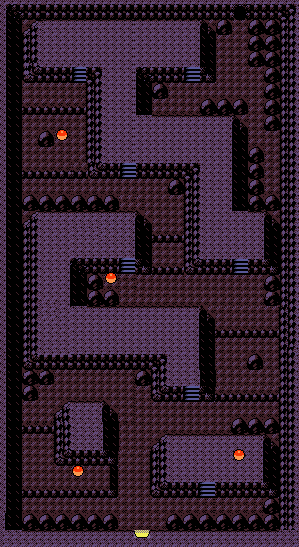 In addition to Pupitar, this area marks the debut of Magmar and Misdreavus, the last new wild Pokémon in Crystal. There are several places inside Mt. Silver where the only way to progress is to splash up a waterfall. Waterfall is a skill you'll need to get to the two items in the small rooms off the second floor (as well as the new Calcium and PP Up that have been added in the Crystal version). The Pokémon that you've taught Waterfall need not be a hard-battling creature—you're going to need six strong Pokémon to defeat Red, but you don't need Waterfall to reach Red. The final battle against Red. On top of Mt. 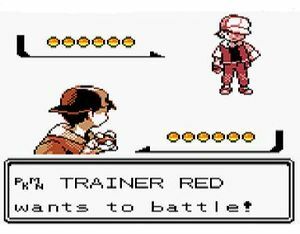 Silver, you will meet the best Trainer in the land—Red. He is by far the strongest opponent you will face in Pokémon Gold and Silver, and you should not underestimate his powerful, excellently equipped team. You should try to attack his Pokémon with Pokémon-types that his Pokémon are weak against. It's a basic strategy, but in this case, it's the best way to go. 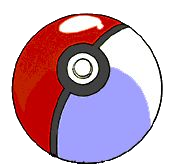 The central character from Pokémon Red and Blue, as well as Pokémon Yellow, is known in Gold, Silver, and Crystal simply as Red. He is the game's toughest Trainer. His Pokémon are all Level-70 or higher, and many different Pokémon types are represented. Try to attack fast and hard—the longer the match drags on, the lower your chance of winning. Your Pokémon should be Level-50 or higher. You'll need a good party with at least a few level 50+ Pokémon to stand a chance here. Houndoom is an especially good choice since it beats Espeon and Venusaur and its type resistances allow it to stall against Espeon and Charizard while you can heal your wounded. Bring a Fighter for the surprise Snorlax (or a Ghost; Misdreavus learns Perish Song at level 46, and there's nothing Snorlax can do to stop it), and your best Water- and Electric-type Pokémon. Thunder-hurling Pikachu may be his strongest Pokémon, so start with a Ground-type if you have a good one! Red's Pokémon are tough, so bring plenty of Revives and Hyper Potions. It may be a good idea to have all your Pokémon levels 70-80, but, with type advantages, it's possible with low level Pokémon too (levels 40-65). If you have a level disadvantage, it's a good idea to have moves which do a fixed amount of damage regardless of stats like Toxic, Sandstorm, Seismic Toss, etc. Level 81, knows Charm, Quick Attack, Thunderbolt, and Thunder. Pikachu can decimate your team if your Ground type isn't on the field. Very easy if you have a Ground-type Pokémon. A single strong blow takes it out most of the time, especially with Earthquake. Consider a Graveler, Donphan or Sandslash. Level 77, knows Giga Drain, Synthesis, SolarBeam, and Sunny Day. It will have a difficult time hurting Pokémon like Ho-oh, Charizard, or Victreebel, and can be easily knocked out with a Psychic, Flying, Fire or Ice-type. Just be careful because it can land incredibly strong successive Solarbeams after using Sunny Day which, interestingly, makes it even more vulnerable to Fire attacks. Use this to your advantage. Level 77, knows Blizzard, Surf, Rain Dance, and Whirlpool. If Venusaur's Sunny Day is still up, or one of the Pokémon on your team changed it, he will change it to Rain. After that, he'll use Whirlpool to cause some damage, and then Blizzard or Surf to do even more. While you might consider using a Grass-type, Blastoise has Blizzard in his move set, so you must be cautious. A strong Electric-type move backed up with a high Special Attack can take Blastoise down in one hit. For example, consider a Magneton with Thunderbolt. Lanturn is another recommendation. However, Ampharos and Raichu have potential as well, as Blastoise won't be able to stand more than a couple of Thunders from them. Level 77, knows Flamethrower, Fire Spin, Wing Attack, and Slash. Instead of packing a weather move, he is reliant upon Venusaur's Sunny Day. Weak to Electric, Water, and especially weak against Rock. Although it can hit pretty hard, it receives massive amounts of damage from Rock moves. Graveler and Onix, or any Rock or Rock/Ground type will do here, taking advantage of Charizard's x4 weakness to Rock. Level 73, knows Psychic, Swift, Mud-Slap, and Reflect. Weak to Bug, Ghost and Dark. Reflect softens Bug or Ghost blows, so anything Dark-typed works wonderfully here. Just don't send in Poison or Fighting types or something with very low Special Defense.You could try a Gengar with Shadow Ball which is super effective. Just watch out for Espeon's Psychic; it could also knock out Gengar in one move. Murkrow is another good opponent for it. Other Dark types, like Houndoom, Tyranitar, and Espeon's cousin Umbreon are good choices. Rhydon: learns Earthquake at level 65 and is specially useful against Pikachu and Snorlax. Kadabra/Alakazam: does good damage to anything but Espeon and Snorlax, using Psychic or Ice/Thunder/Fire Punch. Ampharos: with Thunder/Thunderpunch, Fire Punch and a high level, it should be able to defeat Charizard, Blastoise and Venusaur. Machoke/Machamp: capable of doing huge damage to Snorlax. Heracross: using Endure and Reversal (a fighting move), Heracross can knock out Snorlax in one hit at only around level 50. After defeating the last Pokémon on his team, Red ends the battle and provides you with 7700 ( 15400 if Amulet Coin is held) as prize money. Then he vanishes and you are treated to another run through of the credits. The game will then restart, and you will find yourself at the entrance of the Mt. Silver Pokémon Center. However, unlike after battling the Elite Four, the game will not save automatically after the battle with Red. Hence, you will need to save the game after the battle. If you would like to face off against Red again, you'll need to defeat the Elite Four again first. This page was last edited on 20 February 2019, at 06:42. This page has been accessed 268,580 times.